Last time we had a very successful contest for all our followers (Check it out here). This time also we want to share some goodies with our fans. We will be giving away 2 Pvr vouchers for Mission Impossible : Rogue Nation Movie with two lucky winners of our #MissionPvr contest. 1. Retweet/share the Tweet/post respectively provided with the hashtag #MissionPvr. 2. All retweets/shares should have the hashtag present in them . 3.Participate on our facebook page and twitter page as well to increase your chances of winning. 3. 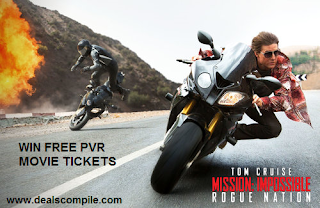 2 Lucky winners will get a Mission Impossible Pvr voucher worth Rs.300. 4. Contest is open till 10 p.m on 18th August 2015. -Contest is only for Indian Residents. -Pvr Voucher will be of Rs.300 . You will have to buy the tickets for the movie Mission Impossible : -The Rogue Nation on www.pvrcinemas.com through the starpass . -There is no entry fee and no purchase necessary to enter this competition. -The promoter reserves the right to cancel or amend the competition and these terms and conditions without notice in the event of a catastrophe, war, civil or military disturbance, act of God or any actual or anticipated breach of any applicable law or regulation or any other event outside of the DealsCompile's control. Any changes to the competition will be notified to entrants as soon as possible by the promoter. -DealsCompile is not responsible for inaccurate prize details supplied to any entrant by any third party connected with this competition. -No cash alternative to the prizes will be offered. The prizes are not transferable. Prizes are subject to availability and we reserve the right to substitute any prize with another of equivalent value without giving notice. -The winner will be notified on the post and/or a private Facebook/Twitter message within 2 days of the closing date. If the winner cannot be contacted or do not claim the prize within 5 days of notification, we reserve the right to withdraw the prize from the winner and pick a replacement winner. -The promoter’s decision in respect of all matters to do with the competition will be final and no correspondence will be entered into. -By entering this competition, an entrant is indicating his/her agreement to be bound by these terms and conditions. -The winner agrees to the use of his/her name and image in any publicity material. Any personal data relating to the winner or any other entrants will be used solely in accordance with current data protection legislation and will not be disclosed to a third party without the entrant’s prior consent. -This promotion is in no way sponsored, endorsed or administered by, or associated with,PVR Cinemas,Mission Impossible Team, Facebook, Twitter or any other Social Network.